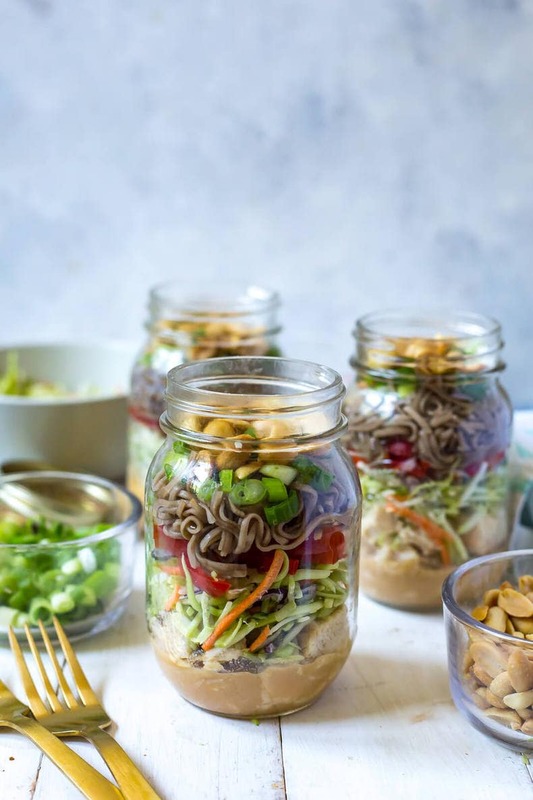 These Thai Chicken Soba Noodle Salad Jars are a delicious summer meal prep idea and a fun twist on a cold noodle salad. 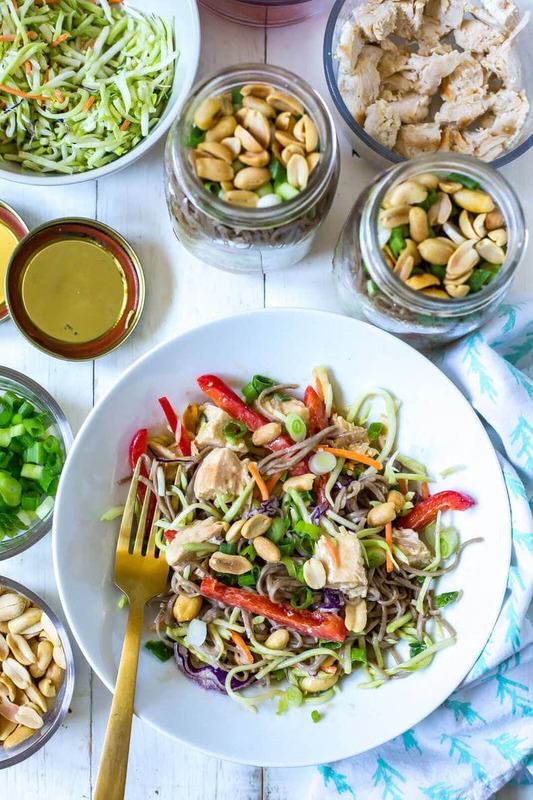 The satay sauce is made extra creamy with coconut milk and peanut butter, and the broccoli slaw and crunchy peanuts add tons of fibre! This post is sponsored by The Peanut Bureau of Canada. Thanks for supporting the brands I love – they help keep my blog up and running! 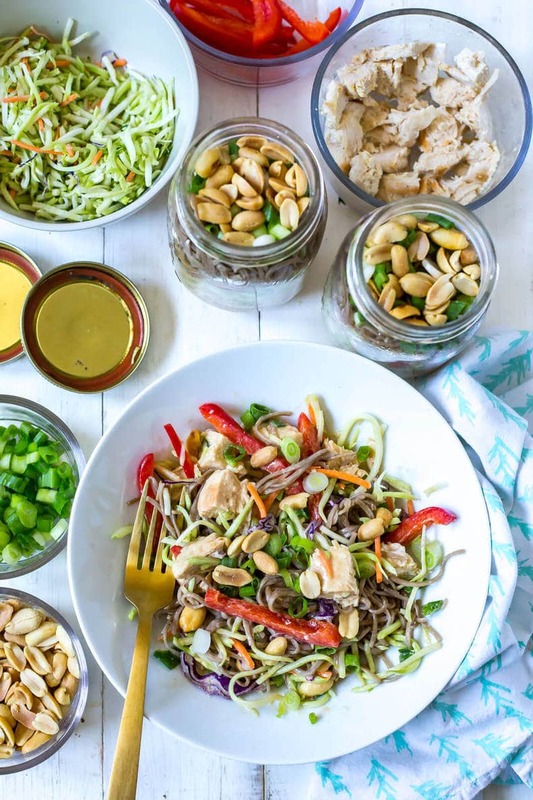 Say hello to a delicious meal prep idea that you can make using leftover or rotisserie chicken! 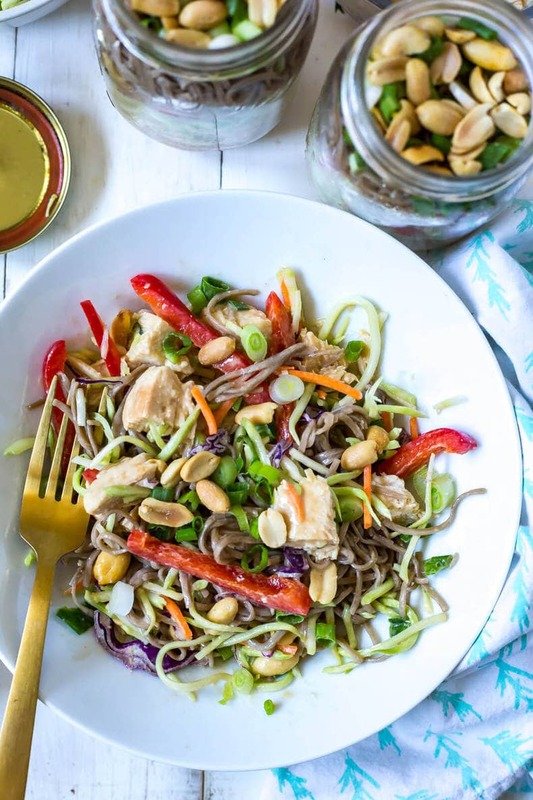 This Thai chicken salad is a tasty lunch option you can bring to work, and it's filled with fibre and healthy veggies – plus the soba noodles are gluten-free for a lighter alternative to pasta. And let's just say that you're going to swoon over the satay-style peanut sauce made with coconut milk, peanut butter, sesame oil and tamari. So good! 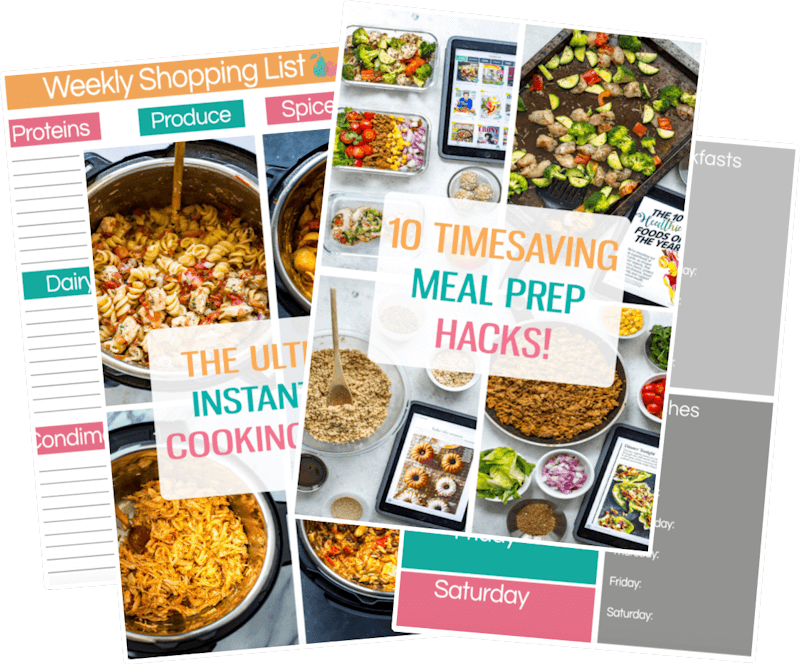 I've partnered with the The Peanut Bureau of Canada again to bring you another amazing meal prep recipe filled with peanuts! Did you know that peanuts are actually one of my fave snacks? I buy a giant bag of salted, roasted peanuts every month and it's a great way to satisfy that craving for something salty and crunchy in the afternoon. Some people have a sweet tooth around 3pm, I have a salty one. Everyone's got their guilty pleasure right?! Except that you don't actually have to feel guilty snacking on peanuts or incorporating them into your meals because they're super tasty and filled with protein, fibre and healthy fats, and I just love the texture they bring to a salad like this. They're also one of the more economical “nuts” (I put that in air quotes because they're really a legume, who knew!) available in the grocery store so you really can't go wrong. 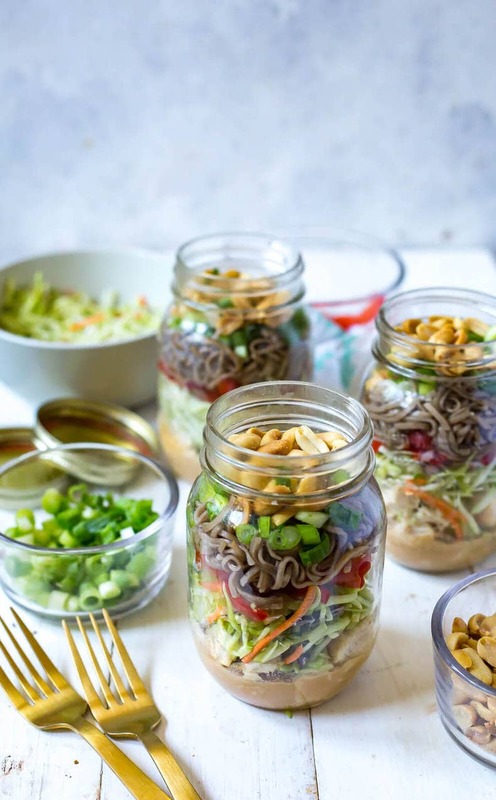 Now this soba noodle salad is super easy to throw together, and the jars are perfect for stacking in the fridge during the work week. 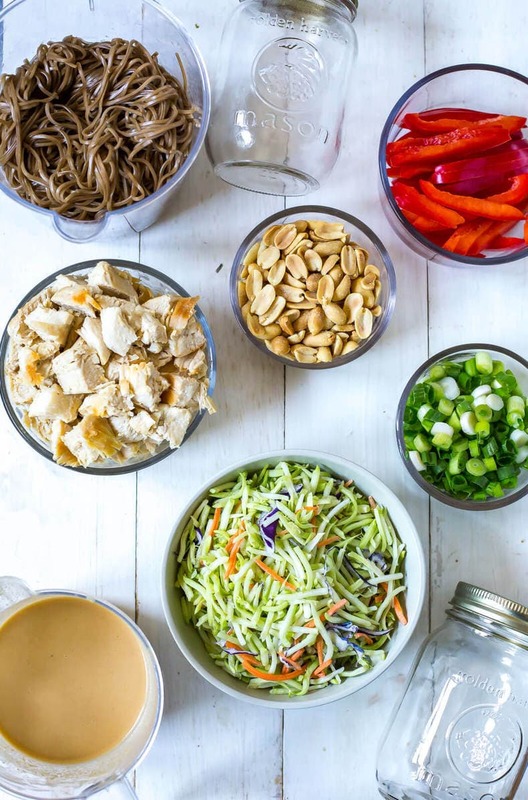 First, you'll make your satay dressing, then add in some chopped up leftover chicken followed by packaged broccoli slaw, sliced red peppers, cooked soba noodles, green onions and peanuts. They only take about 10 to 15 minutes to assemble once you've got the ingredients laid out, and that's mostly because we're using ingredients that have been prepared ahead of time. 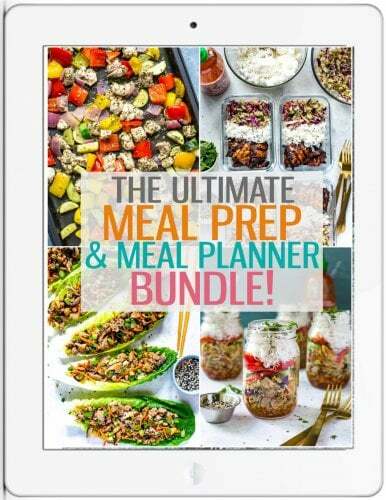 This is one meal prep strategy that really works for me. I love to buy healthy packaged veggies at my local grocery store; they may be a tiny bit pricier but the amount of time you save really is worth it, and you can still enjoy healthy foods without the giant price tag. I find anytime you can skip a few steps in the meal prep process you're more likely to follow through on prepping your lunches in advance each week. Consistency is key after all! 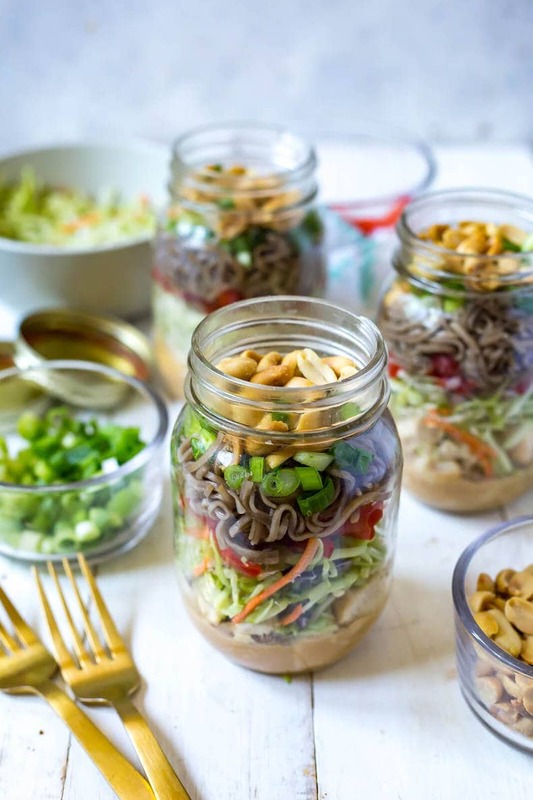 The satay sauce should come together with just a few pantry staples so you shouldn't need to worry about making a complicated recipe you have to go to the store for, and worst case scenario if you don't have leftover chicken you can always use rotisserie chicken or saute some chicken cutlets up quickly to use for these jars. And technically, you really don't even have to use chicken! 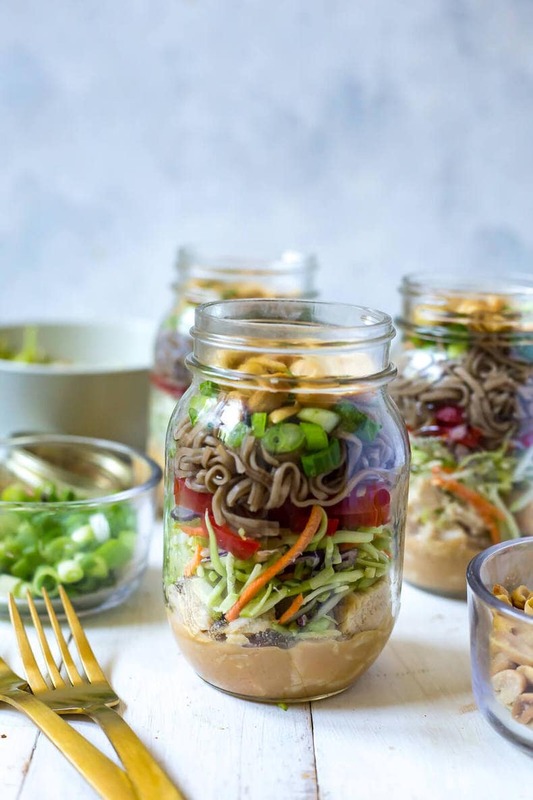 Feel free to make this soba noodle salad vegetarian by using chickpeas, lentils, edamame or tofu, or you can use other types of leftover meats and proteins as you have them on hand. I'm all about keeping meal prep simple and using up whatever you have in the fridge so don't be afraid to get creative! 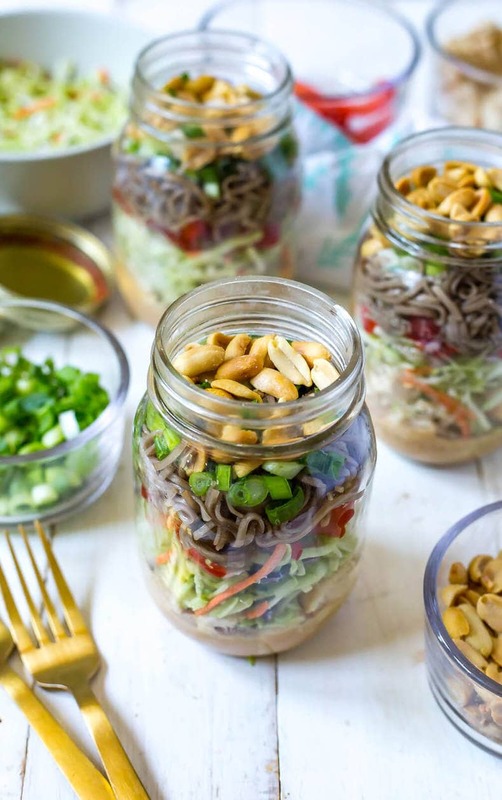 Will you be making these Thai Chicken Soba Noodle Salad Jars? I'm going to need lots more fun summer lunch ideas like these in my life! And gimme ALL the peanuts! If you try any of my recipes be sure to let me know on Instagram, Twitter, Facebook or in the comments – I’d love to see what you come up with! Cook soba noodles according to package directions (usually 2 min in boiling water) and whisk together the ingredients for the satay sauce. Add sauce to bottom of a 950mL mason jar, followed by leftover chicken. If you need to cook the chicken fresh instead of using leftover chicken, saute four medium-sized chicken cutlets (or cut two medium-sized chicken breasts in half) in a skillet with a bit of olive oil over medium-high heat for 7-8 minutes per side, then cut up into bite-sized pieces. Otherwise, continue on with the following steps below. After you add chicken, add broccoli slaw, red pepper and soba noodles. 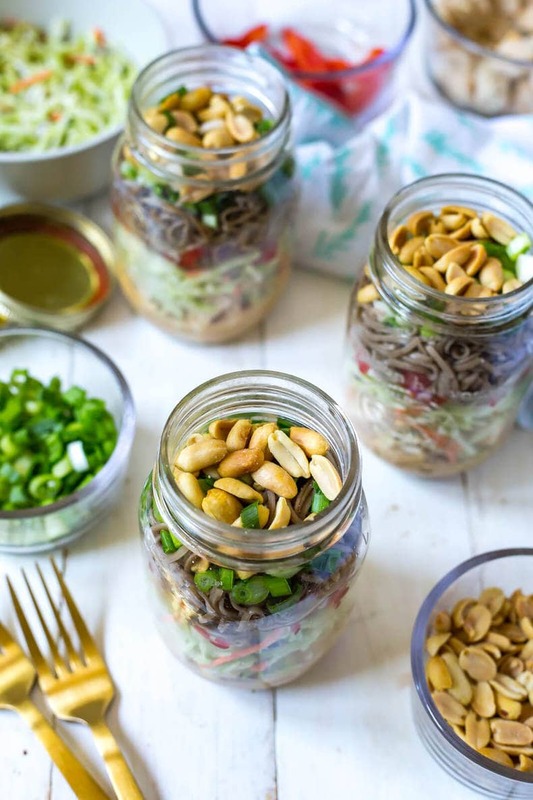 Top each jar with green onions and peanuts. 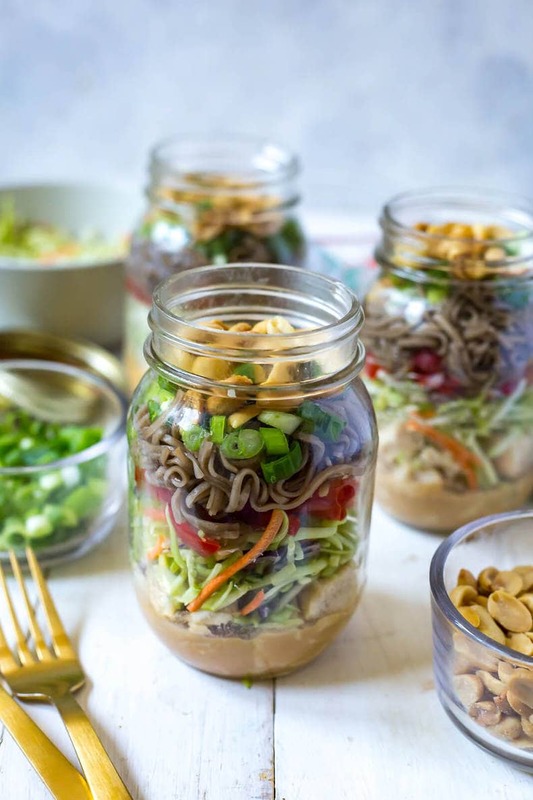 Shake jars before serving to distribute sauce, then pour into a large, deep bowl and enjoy! Bonus: if you'd like, garnish with fresh herbs like cilantro or basil. I would like to suggest using ‘Wide Mouth’ One Quart Mason jars for this recipe. In US mason jars are referred to as Wide mouth jars or Small mouth. Popular Mason Jar brands in US are Ball or Kerr mason jars. They come in different ounce sizes. Wide Mouth, One Quart 16 Oz, or Half Quart 8 Oz. 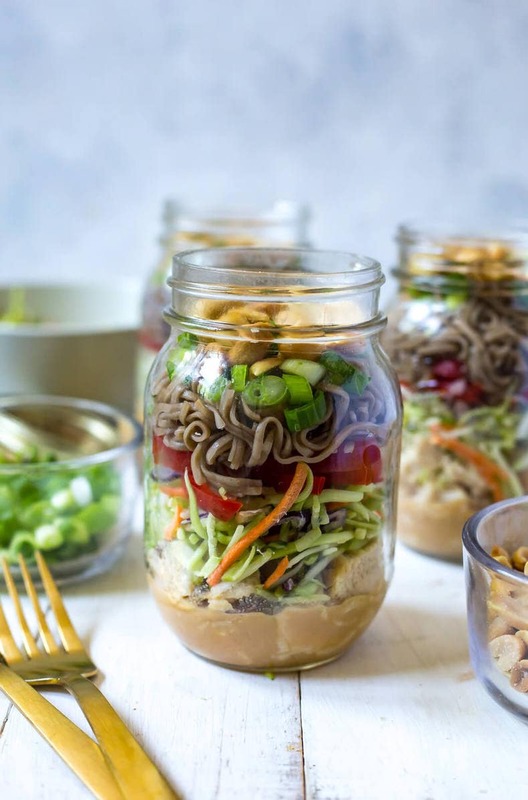 jars are best for meals in a mason jars.